Remote viewing is like parachuting. As an Army paratrooper I learned about parachutes. 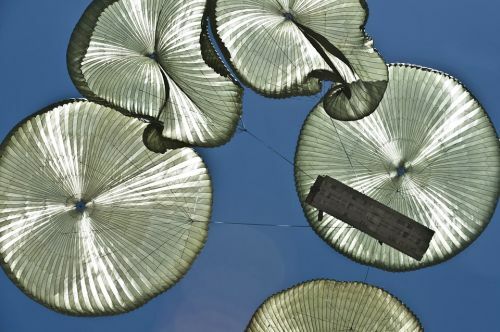 I learned that one of the most beautiful sights in the world was looking up after the opening shock of the parachute deploying and seeing that I had a full canopy over my head, lowering me gently to the ground. Almost as beautiful was to look around from such a rare perspective and realize that I was seeing the world in a way shared only by the few people who dared to do what I was doing. Learning remote viewing is like that. Parachutes can, of course, be used for practical things. They are useful in military and commando operations and are handy for getting people to remote places to fight forest fires. They can also, for example, be used to insert rescue personnel into emergency situations, or to lower vital supplies, equipment or even space capsules safely to the Earth. Remote viewing also has its practical uses. Among other things, it has been used in intelligence collection, crime-solving, finding missing persons, market predictions and investing, and even space exploration. Ever since I started teaching controlled remote viewing commercially, curious people often ask me variations of the question “Why learn remote viewing?” or “What good is remote viewing?” I usually begin with the practical applications I just mentioned. But after thinking about it over the years, I add what is probably the more typical reason: Maybe people want to learn remote viewing for reasons similar to why others learn to skydive. This may seem a little surprising at first, but let’s start off by asking, “What good is skydiving?” I already cited various uses for parachuting in general. However, the vast majority of people who learn to skydive do it not for any so-called practical reason. They do it because it presents a challenge–the thrill of overcoming nature (gravity) and the natural human fears that come with it. They also skydive because it puts them in a class of people who go beyond the ordinary, seeking an experience that teaches skill and self-mastery. And they simply glory in the experience of floating all alone, however briefly, thousands of feet above the earth. It can be scary at first, but it is always thrilling. You could say the same about remote viewing. Like skydiving, RV has its practical applications, and many acquire skill and expertise that does indeed help them solve real-world problems and challenges. Yet the majority of people who learn remote viewing do so not because of how it can be used so much as the challenge it represents–learning to do something that few other people as yet know how to do; or acquiring a skill deemed impossible by mainstream society; or because it provides convincing and satisfying proof that we are, indeed, much more than our physical bodies (of course, that realization can have practical implications as well). Skydivers learn it is possible to transcend the fears and perceived physical limitations that deter the average person. Remote viewers learn something analogous: It is possible for our consciousness to transcend the boundaries space and time as well. Is there enough value in that to justify the work and, often, expense demanded to become proficient in this remarkable consciousness-based skill? Many people believe there is, and they have acted on that belief. Do you have what it takes to be one of them? Sign up for one our highly praised remote viewing courses today!